Parents, let’s sit and rap about cruise ships for a minute…they’re great, right? If you think about it, they’re basically the new tropical island: everything you could ever want is on board, and you can let the kids loose without having to worry about them getting lost or stolen or falling into a crew of plucky orphaned street urchins who survive by belting out charming songs and then pickpocketing unsuspecting, admiring tourists (though, we gotta be honest…if our kid did fall into a group like that, we’d be like, “Cool! See ya! Make sure to include us in the credits of your upcoming smash Broadway Musical!). What we’re trying to say is, there isn’t any wonder to the fact that you took your kid on a cruise and now it’s all he talks about. You thought you were doing yourselves a favor by getting few child-free hours in, and meanwhile, the kid got to go to paradise! He got to live his life, unsupervised, while you were living yours! While you were sunning on the upper deck, he was learning the art of the trapeze and why an unlimited seafood buffet is such a big deal and how to really make a living as an aerobics instructor! You gave him a taste of the good life. And he wants more. In fact, he wants it all the time: The requests to turn every meal into a buffet and organize evening entertainment and put a pool in the middle of your living might seem like a bit much, but you did this! You put the thirst for the sea in him, and now he wants to drink! 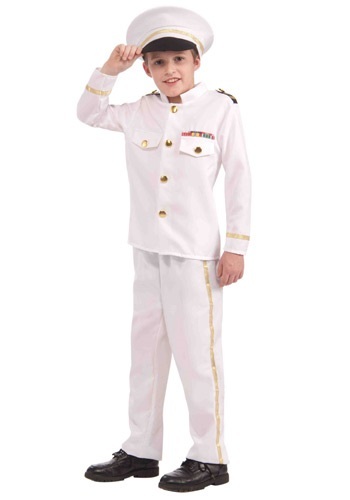 So take responsibly for your choices by giving him this Child Navy Admiral Costume! Sure, he might never take it off again, but it’s the next best thing to putting up a ropes course in your backyard and hiring a full-time kid activities instructor, now, isn’t it?